There are currently no prescription treatments, laser treatments, LED light or over-the-counter treatments that repair rosacea-damaged lymphatic vessels, fix non-functional lymphatic vessels or stimulate new growth of lymphatic vessels from pre-existing branches. This crucial part of treatment has been completely overlooked by almost all physicians… and it’s probably one of the main reasons rosacea sufferers only notice mild improvement in symptoms with most standard medical treatments and no improvement in rosacea triggers. 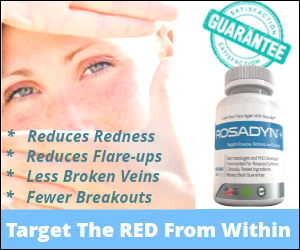 This is such an important part of rosacea treatment that Vascular Health Specialists focused considerable time, research and testing into finding multiple pharmaceutical grade nutraceuticals that have been clinically proven to help every aspect of lymphatic health in rosacea-affected skin. The biopsies, the medical research and the Doppler system measurements showed just how important it was to treat these fragile vessels — so much so — that we don’t believe most rosacea sufferers can fully treat rosacea symptoms and triggers without targeting lymphatic vessel damage and dysfunction. Our research highlighted five main nutraceuticals that each benefited lymphatic vessels in a different way. Hesperidin makes lymphatic vessels more effective by allowing them to engulf greater numbers of inflammatory molecules — and at the same time — protects the inside lining from any damage that may be caused by these substances. Menaquinone-7 has a very unique mechanism of action. This substance inhibits an enzyme that allows calcium to build up in the lymphatic vessel’s wall — stopping the process of “vascular hardening” where lymphatic vessels stop functioning normally because they calcify. This is not only an inflammatory process, but it occurs as vessels age, so Menaquinone-7 keeps vessels younger and healthier for a much longer time whether they are subject to daily bouts of inflammation or just plain aging. Once again, this treatment is completely overlooked by the medical establishment and even Naturopathic Physicians. The five special ingredients that target lymphatic vessel health and protection will make a noticeable difference for many rosacea sufferers.